When you see a Bedlington Terrier for the first time you could be forgiven for thinking that you are looking at a dainty lamb-like animal. Their unique and stunning appearance is quite unlike any of the other terriers in the terrier group, and they were named after a village in Northumberland (England) where they were first bred. Despite their appearance, they were swift and efficient hunters of otters and badgers that their farmer owners used them for hundreds of years ago. This breed of dog usually lives up to 12 years of age but can live to 14 years with the proper care and diet. A healthy female will usually weigh up to 8kg and stand 38cm tall, and the male should weigh up to 10kg and stand 43cm tall. 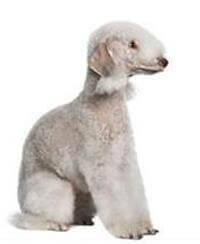 The Bedlington Terrier is a good-tempered and graceful dog with plenty of courage. It is thought that Whippets were bred with the dog's ancestors to help develop its shape and the ability to run. The Bedlington is a good family dog that will happily attach itself to all members of the household. These agreeable dogs get along with most other animals in the home, particularly when raised together. However, it is important to remember these animals were bred as hunters so supervision of any small animals in the home should be exercised. Trim the coat occasionally to keep it spotless and looking smart. Training these intelligent dogs is relatively easy – particularly if a firm and consistent routine is established at an early age. Their Whippet heritage means they love to run to regular exercise is a must with the occasional bit of ‘off leash’ time so they can really flex those muscles. This dog easily adapts to most people and their situations but is most suited to those with plenty of space to roam in the backyard and enough time for regular walks and runs.